The robot was built for simplicity and reliability with a single PIC chip, a couple of stepper motor drivers, infra-red photodarlington sensors, 5V and 12V voltage regulators and little else (I'll open up our project wiki to the public when I fix python). This approach paid off today because we came 2nd out of 18 in the final robot races in the Great Hall at Birmingham University in front of a cheering crowd. In our first heat we came off at the first corner, but after a quick nudge completed the course with no problems, albeit quite slowly. Unfortunately we were still running the software we programmed for the qualifying race which was designed for accuracy rather than speed. We had intended to replace the software with the fast version of the code which accelerated from low speed/high torque to high speed/low torque at appropriate times and automatically calibrated the white/black threshold for the infra-red sensors. Unfortunately our department is being refurbished and we didn't have access to a lab to do the reprogramming. But it didn't matter, we got through. To our surprise we reached the semi-finals. Despite the technician putting our power supply in the wrong way around to start off with (thank you Alex for designing the electronics in such a way that this didn't just fry the robot!) we actually won the semi final. The opposing team's robot was built for speed. It was extremely fast but it turned out it was a little too fast because it burnt out one of its motors and we crawled past it on the home straight in a perfect case of the tortoise beating the hare! We didn't win the final, but were very fairly beaten by a robot which had both speed and endurance, so congratulations to the winning team! We were all absolutely thrilled with the result and it makes the hours of work worthwhile. I want to say thanks to the whole team who worked brilliantly together (I didn't have to enforce my position of team leader once :P). Special thanks go to Alex for his algorithm simulations using a 2D gaming engine, his programming skills (I now trust him to compile C more than the CCS compiler) and his help with the electronic design. 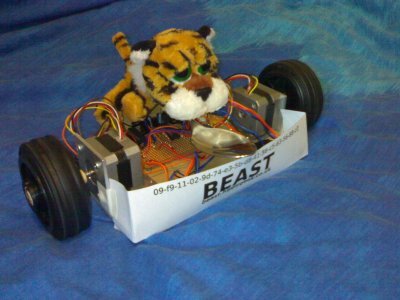 I also want to thank Laura for providing the tiger who did a great job of driving and turned out to be our lucky mascot!